by Noel Tyl, Llewellyn, 2006. Noel Tyl is one of the most prolific authors in American astrology and has here produced an elegant and simple approach to vocational astrology that is very much to the point and rather more streamlined than many of his earlier works. He has laid down an easy-to-follow set of procedures which, with a little commonsense, will lead any practitioner to clearer, more precise, and more understanding career counseling. 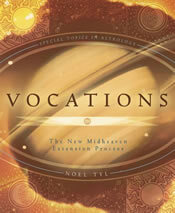 First and foremost, the book reaches to define a new sense of what a vocation is these days. In covering all these bases, the author comes to a general conclusion (without exactly saying so) that it is at heart something like the Homeric/Platonic idea of thymos, the inner drive to do something meaningful and be recognized for it, at whatever level of talent, skill, or opportunity is available in your life. Hegel fretted about it, Nietzsche glorified it, current neocons redefine it, but inside the human breast (literally, which the thymus and heart cohabit) there is a well-spring of desire to fulfill some sort of “reason for being” and that is the seed of aspiration and ambition, the very makings of career and the answering call to dharma that drives it. The simple key to unlocking this life pathway lies at the Midheaven and all of its connections — Tyl calls his approach “The New Midheaven Extension Process.” Basically, it’s a checklist to follow that leads from the MC, its ruler, and its aspects to the rest of the chart, and thence to specific areas that will be both desirable and possible for the individual to pursue. And, it’s a very good and clear checklist that makes it seem easy, with some of our favorite personal stops along the way. You start with the sign and planet ruling the MC and then chase dispositors until you hit a final one or come round in a circle. The planets, signs, and houses you rake in there tell the main story. But there’s much more: mutual receptions, dual signs, stelliums, strong aspects to the MC, and a fave of ours, the Oriental planet (that rises ahead of the Sun). All these tell you a lot — and then there’s those wild peregrine planets that take off all by themselves, a select set of midpoints (esp. Sun/Moon), “Aries Point” planets (extremely late mutable/early cardinal), and quintiles and duodeciles which are real talent and motivation signals. The checklist is reaching a dozen at this point, which begins to stretch common memory-retention, but the author (with Jupiter ahead of the Sun in Capricorn, his chart is the first example) is kind enough to say when enough is enough. You don’t have to look at every factor all the time, and in his repeated examples there is a convenient point when he just writes STOP, when there’s enough there to make a good judgment without drowning in all the possible encroaching details. By following through the examples in the book, you get a good feel of how and when to call your own halt. But the telling part is how a practitioner puts all this into context, and context is all. The level of actual education, cultural and economic background, and available opportunity of the client is critical. A few well-placed queries as you go along will do everything to steer your theoretical observations into practical advice, which is very much a key to being a successful consultant. Here the author is clear that it’s all about talking with real people, finding their level, and helping them develop it from the inside out, not from the top down. You get that part right by doing it a lot, as he has. What’s really fine about this approach is its simplicity, which when straightforwardly applied takes a fractal-like formula and turns it into a rich tapestry. And, if you get lost along the way, you can go back and start over, no problem. Astrology is ideally designed to do just that, and it’s wonderful to see it done so clearly. Like a great tree, when your roots are thoroughly planted in the earth, your branches can easily extend all the way to heaven.